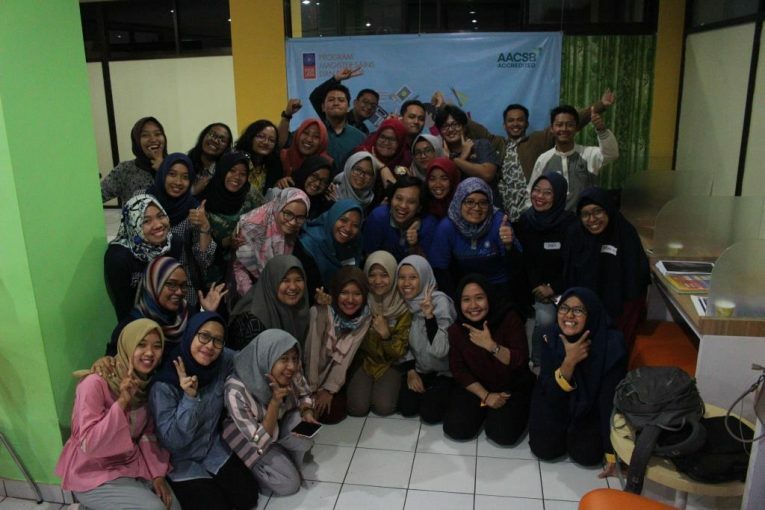 Yogyakarta – Friday, October 26th 2018, after the success of organizing the first design thinking workshop last May, the Master of Science and Doctoral Program, Faculty of Economics and Business, Gadjah Mada University (MD FEB-UGM) held a design thinking workshop to the second time. Speakers at this workshop were Nurul Indarti, Sivilekonom, Cand. Merc., PhD and RR. Tur Nastiti, M.Sc., PhD. The design thinking workshop held at the 1st Floor Student Lounge of the MD FEB UGM building was then opened directly by the two speakers. Nurul Indarti, Sivilekonom, Cand. Merc, PhD explained that facilitating the workshop is an attempt to teach and encourage students to think differently and innovatively. The next explanation about the fact about perception difference between fresh graduates and employers. Seventy per cent of new graduates considers that they have critical thinking that is useful in work, but only 30% of employers agree with the statement. Based on these facts, there is still a gap between the ability of new graduates and the expectations of the company (employer). Therefore, improving the ability of critical thinking is important in the current education and design thinking workshop is one solution to hone the ability to think critically. Participants consisting of students of Master of Science in Economics and Master of Science in Accounting who are still taking the second semester on MD FEB UGM. The facilitator then formed 5 teams, each team consisting of 5-6 people. The formation of a team aims to make students know each other. Each team follows 4 steps in building a thinking design namely, discovery, interpretation, ideation, and experimentation. Later forms of experimentation are to build a prototype that describes the problem and alternative solutions offered. Hanani, one of the students of the Master of Accounting Science, said that the design thinking learning process is very helpful in coordinating the right brain and left brain in a balanced manner, being able to think later and find solutions. This is in line with the expression of Rozi Aisyah who is a Master of Science in Economics student that through this design thinking workshop, Rozi can know many friends and find new terms in the thinking process. Tur Nastiti, PhD as the speaker also mentioned some of the benefits of design thinking workshop that is, participants were taught that in the process of solving the problem must understand the problem first which then presents many solutions to the problem. Each participant must also understand that thinking “out of the box” is important, and trying to think laterally.